Brock Mealer was told by doctors that his chances of walking again after a car accident that claimed the lives of his father and brother’s girlfriend stood, optimistically, at 1%. Mealer compared those odds to the ones faced by Donald Trump, just hours before Trump formally accepts nomination as the Republican presidential nominee. “Guess who else was told he had a 1% chance?” Mealer said. “A company that analyzes polling data for CNN predicted last year that Donald Trump had a 1% chance of winning the Republican nomination for president.” To cheers, Mealer happily acknowledged that Trump, too, had overcome the odds. “Mr. Trump, welcome to the club,” he said. 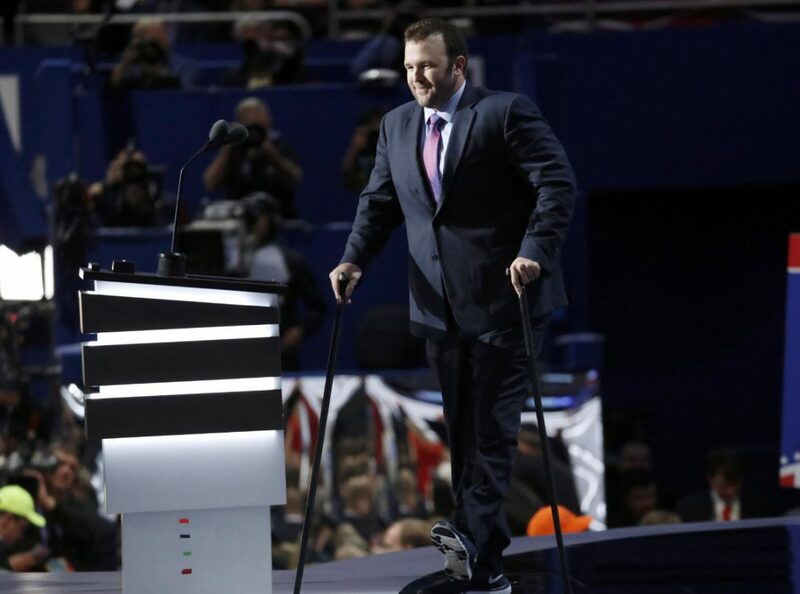 Brock Mealer was told by doctors that his chances of walking again after a car accident that claimed the lives of his father and brother’s girlfriend stood, optimistically, at 1%. Tonight at the Republican National Convention, Mealer compared those odds to the ones faced by Donald Trump, just hours before Trump formally accepts nomination as the Republican presidential nominee. To cheers, Mealer happily acknowledged that Trump, too, had overcome the odds. “Mr. Trump, welcome to the club,” he said. Mealer was speaking in Cleveland thanks at least partially to his aunt, Sandy Mealer Barber, the chair of the Fulton County, Ohio, Republican Party. Throughout his speech, Mealer made sure to drop references to his alma mater and the school whose football coaches welcomed him into the fold alongside his younger brother, Elliott, a former Michigan offensive lineman. Mealer’s “Rich and Mike” are two well-known figures in the Michigan football universe: Former head coach Rich Rodriguez and former strength and conditioning coach Mike Barwis. In the end, Mealer’s rallying cry played perfectly into the theme of the night — a play on Trump’s “Make America Great Again” campaign theme. Remembering the help he received from Michigan coaches and support he received from Michigan fans, Mealer urged delegates to united behind Trump.